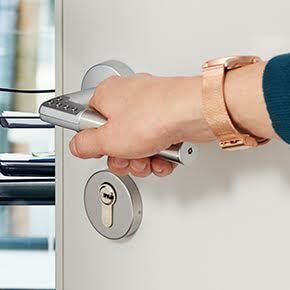 Code Handle® from ASSA ABLOY is a simple, secure, easy-to-fit handle with a built-in PIN-pad that locks the door for you — with no wiring, no expensive access control system, no cumbersome keys and no major changes to your current door. Code Handle works with an electronic PIN code to make sure only authorised people can unlock the door. Press a 4-digit code on the handle’s keypad and the door opens – quick, simple and much easier than using keys. Code Handle adds security and convenience to any private room adjoining a public area. witch Code Handle, you’ll receive a Master Code and up to 9 different user PINs. In addition, to make things even simpler, it locks itself when you close the door. Code Handle is easy to install and retrofit as it works together with your existing locking unit: keep the cylinder or lock and only change the handle to a battery-powered Code Handle. All it takes is two screws to fit a Code Handle to almost any interior door. No need to cable the door or connect it to the mains. No need to install a complex system. When do you need Code Handle? What is in your archives? Irreplaceable documents deserve an extra layer of security. Are your drug and medicine stores safely locked? An all-in-one secure PIN and door handle keeps casual intruders at bay — and keeps you on the right side of compliance. If your shop is busy, who keeps watch over the storeroom? Public areas with high traffic are hard to police when you can’t afford a security team. So, if your toilet is for customer use only, Code Handle keeps it locked without the hassle of a key. And what about the office? Surely not everyone on your floor should be reading the documents you left on your desk? Code Handle keeps sensitive files, private rooms, personal belongings or valuable stock separated and secure from the public. A security system ideal for a variety of different environments.